Pineapple India food industry is a leading international manufacturers, exporters and suppliers of organic pineapple products like canned pineapple, fruit juice concentrate, pulp and slices. Pineapple India has its head office in the easternmost region of India, Nagaland. Pineapple is the most popular and important tropical fruit of North East (NE) region of India. Pineapple India identified the potential of Nagaland as there has always been a phenomenal growth of pineapple in this region. Through adoption of modern technology we were able to gain a substantial increase in area of processing pineapple Bi-products. Pineapple India has attained HACCP food safety management system certification and has ISO international quality management system certification. From selection of pineapple to the final product each step is meticulous performed. 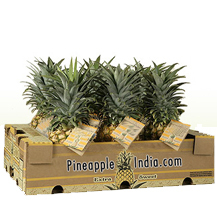 We at Pineapple India are committed to manufacturers & export high quality best products for our customer. Every product from us can be trusted and believable. The extensive research done is providing satisfaction to our customer by using global monitoring trends. Pineapple India realizes and always emphasizes that quality comes first. Please can you quote me for 500KG Organic Pineapple Powder, FOB to local port. RAW (not pasteurised) is best. Thanks! Pineapple pulp is obtained from high grade selected ripened pineapple. Fully Ripened Pineapples are inspected then washed, blanched and further extracted for pulp. The processed pineapple pulp is packed into different aseptic packing of various sizes and stored at a given temperature. greetings from Bolivia, we are looking for an entire pineapple plant production for a tropical zone (the government is investing in this sector with the mentioned pineapple plant), if you are machine manufacturers or you can recommend some one please email us.